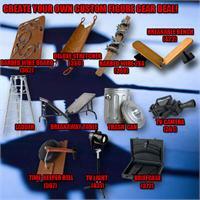 Home > Wrestling Action Figure Gear > Wrestling Action Figure Gear Special Deals & Playsets > Create Your own 3 Piece Figure Gear Deal! For the first time ever Wrestlingsuperstore.com is allowing its customers to create their very own custom figure gear deal! Simply pick from the three drop down options above which items you would like, and we will take care of the rest. Its that simple! All of the options can be seen if you click on the image and look through the multiple images.